Your choice of toppings; cheese, mushrooms, bacon, onions, spinach .50 cents each. 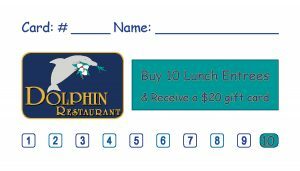 Before placing your order, please inform Dolphin staff if a person in your party has a food allergy. Some menu items may come into contact with peanuts, tree nuts, milk, eggs, fish and shellfish. All sandwiches are made with the best quality deli meats and are offered on white, wheat, pumpernickel , or bulky roll. Served with pickles and chips. All our entrees are served with mashed potato, vegetable and or house slaw. after dinner drink, a hot coffee or a dessert wine. 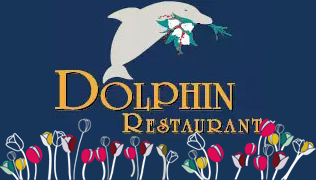 Ask about our nice Dolphin tee shirts, hats and sweatshirts. Not responsible for medium well or well done food. Not responsible for misplaced or lost items.